Whoever said that running a business is easy is clearly not a businessman. It’s true that you are your own boss and you can manage your time according to your own preference. Nonetheless, running a business is not a bed of roses. You need to ensure that your suppliers are paid, your customers are happy and satisfied with your product, and above all, your business is earning a profit. There are also expenses you need to worry about like your employees’ salaries, cost of raw materials, and utilities expense among others. What if you fell short of cash? Who do you run to for help? Some business owners use their own savings to augment business expenses. The issue with this is that emergency could happen in the family and you need that savings account. This is where Esquire Financing could help. Read on to find out who Esquire Financing is, what it can do for you, and how to apply in case you need additional working capital. Who is Esquire Financing? 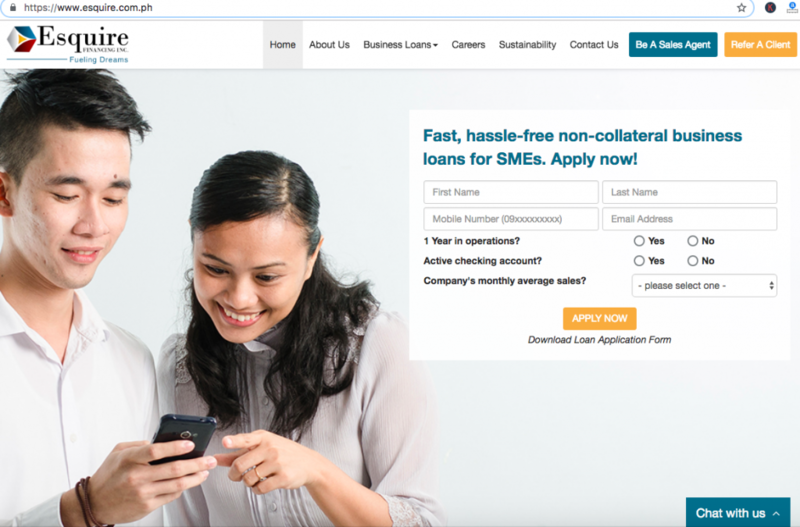 Esquire Financing, Inc. is a SME-lending company that offers fast, non-collateral business loan to help manage the needs, goals, and cashflow of a small-medium business owner in the most hassle-free way possible. The company’s primary goal is to make business loans convenient and accessible to help achieve success. Esquire Financing, Inc. stands by its three values: Efficiency, Flexibility, and Integrity. 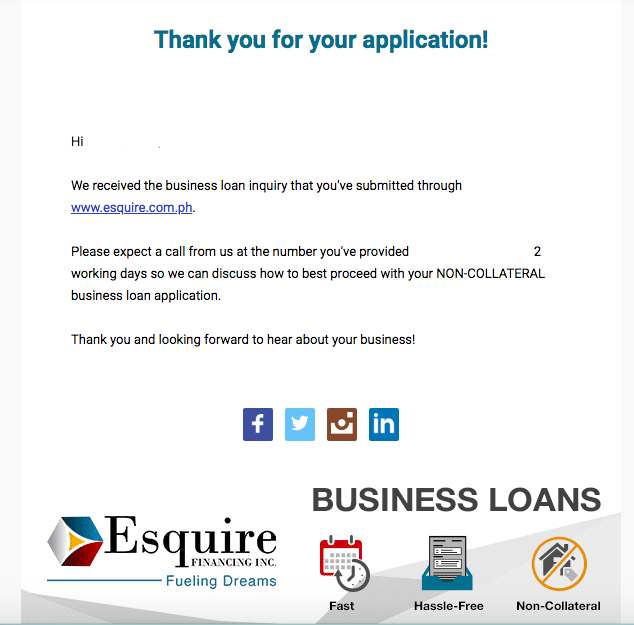 Take note that Esquire Financing, Inc. is focused on providing business loan for SMEs and does NOT accept any others types of loan such as personal loan and housing loan. Filled out and signed application form. You can get a copy of the form here. Fill out the loan application form. You can get a copy of the application form here. Submit the compulsory and corresponding additional requirements together with the application form at Esquire Financing, Inc.’s main office. 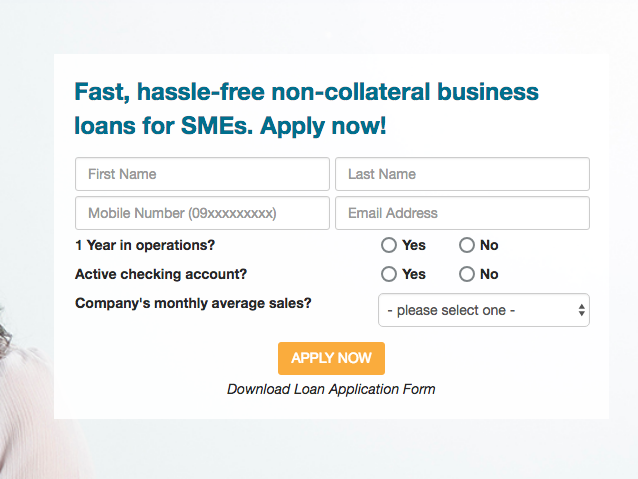 Fill out the Business Loan Inquiry form. A confirmation message will be sent to your email address. A Loan Specialist will contact you to discuss the best way to proceed with your loan application. if qualified, you will be asked to submit compulsory and corresponding additional requirements in their main office. If approved, you can now claim the proceeds of your loan. For further questions or concerns, you can contact Esquire Financing, Inc. by checking out the available modes through their Contacts Page.